There is a very famous jug found in what is now Tooley Street in the Southwark borough of London. It doesn’t look like much; it’s about a foot high, just terracotta, with a graffito scratched on its surface. The jug is dated to the latter part of the 1st century CE. It’s important because of what that graffito says. It says,”LONDINI AD FANVM ISIDIS,” that is, “To London at the temple of Isis”. Thus it confirms the existence of a temple of Isis in ancient London. One more reference to the temple has been uncovered locally as well. It’s a 3rd century CE altar (which had been used as part of a wall) with an inscription that states that the Isis temple had fallen down due to age, but had now been restored. An Italian terracotta showing Isis with Harpocrates and Anubis. Her London devotees may have owned similar votive images. The jug has been presumed to be a wine jug that may have belonged to a tavern near the temple, perhaps even a tavern dedicated to Isis. There is archeological precedent for taverns being located near temples as well as for being dedicated to Deities. Other scholars have wondered whether the jug may have belonged to the temple itself. In particular, some have suggested that it may have been part of the feasting that would take place at temples by the religious associations who tended them. There is precedent for this, too. Back in Egypt, demotic texts speak of “Days of Drinking” that became a term for the meetings of such groups. In Egypt, the groups were probably influenced by Greek symposia, meaning “drinking together,” and thiasoi, which were voluntary religious associations like our modern covens as well as larger organizations like the Fellowship of Isis. Yet there was native tradition, too. A scholar who studied this believes that the demotic name, Days of Drinking, may derive from one of the ancient Egyptian lunar festivals, which would no doubt include feasting and drinking as well. 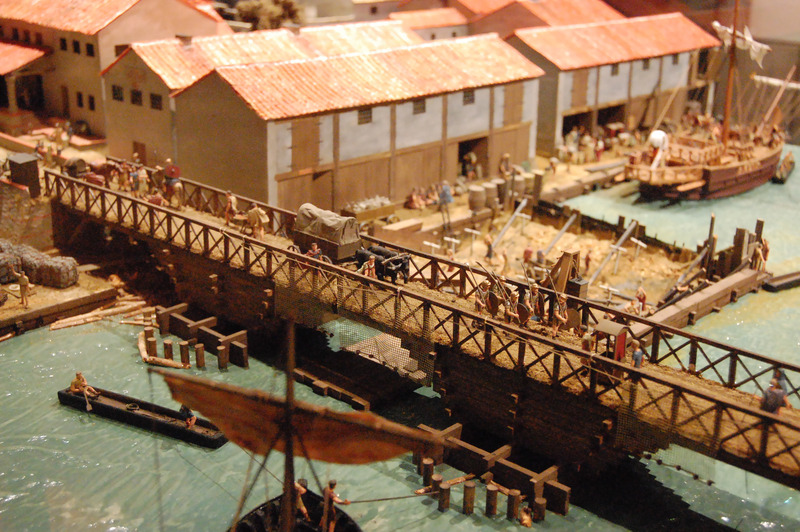 Such an association of Isiacs would not have been out of place in Roman London. We find them throughout the Empire. 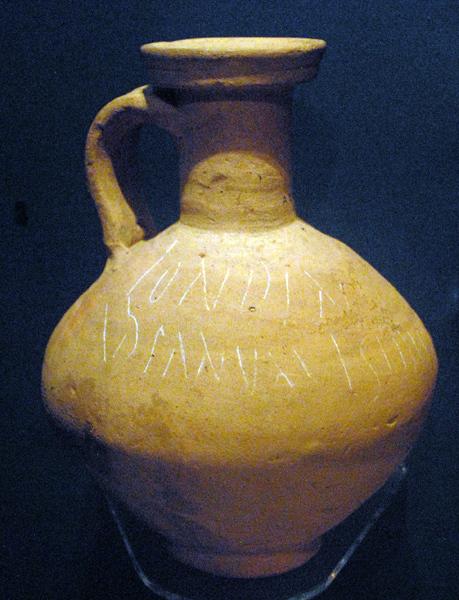 Archeologists have also found several other jugs inscribed with Isis’ name from other parts of the Empire. I haven’t been able to find out whether anyone has actually tested residue from the Southwark jug to discover if it ever contained wine, but it sure looks like a classic wine jug—whether for use as part of the religious festivals at the temple or by the tavern next door. The Southwark jug is, of course, not the only vessel with which Isis is connected. By the Late Period, She is especially associated with what is usually referred to as a situla, a container for sacred liquids. Many representations of Her show a sistrum in one hand and a situla in the other, some of these situlae conspicuously breast-shaped. The situla is not exclusive to the religion of Isis. From approximately the 19th dynasty onward, these small ritual buckets, washeb in Egyptian, were used to carry offerings of Nile water or milk in the cults of many Egyptian Deities. 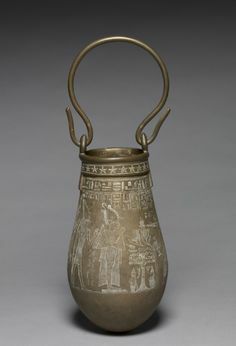 A text from Denderah that describes rites for Osiris specifically mentions a “situla of gold.” Situlae were usually decorated with scenes involving fertility, nourishment, or the cult of the specific Deity for Whom there were being used. 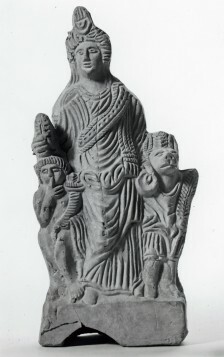 Scenes on the situale might include images of the nurturing Cow Goddess, images that suggest fertility, such as the plump Nile God or a Child God on a lotus, or sexual images such as the ithyphallic God Min. It seems clear that the breast or womb-like vessel was associated with the nurturing, fertile, and sexual aspects of the Divine—and thus very appropriate to Isis. While the situla is spoutless, a different type of spouted vessel is also connected with Isis. It is the urnula or hydreion. It is from a later period and found in Isiac representations outside of Egypt. I have argued in Isis Magic, that Isis is one of the Great “Container” Goddesses, that is, one of the Great Mother Goddesses Who Contain All Things. The concept of the Mother as Great Container is easy to understand. Like the human mother who contains the child and, once born, the milk to nourish it, the Great Mother contains all creatures and provides sustenance for them through the blessings of nature. 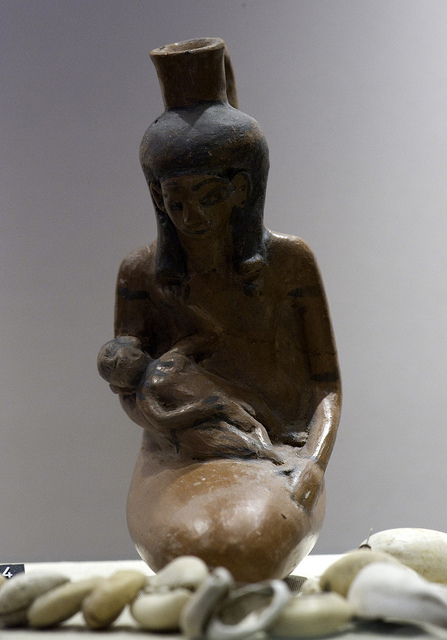 Judging by the numerous gynomorphic vessels that have been found throughout all regions of the world, the concept of Great Mother as Container of All appears to have been common throughout the prehistoric world. So, from a specific Isiac vessel, we can take our exploration of Isis to an expanded and more symbolic level. She is at once the Goddess celebrated in feasting and drinking together and She is the Lady of the Vessel and the Great Vessel Herself. She is the All-Containing One Who gives us life and nourishment, in life and in death. Ancient LondonAspects of IsisEgyptian TemplesGoddess IsisGoddess worshipIsisIsis in LondonIsis MagicIsis RitualsRoman IsisSitulaSouthwark Isiac jugTemple of Isis LondonThe GoddessUrnulaWho is Isis? I can’t believe it. I just posted an image of that exact same situla on twitter and was just searching for a jug similar in size and shape to the Southwark jug. Your timing is impeccable.